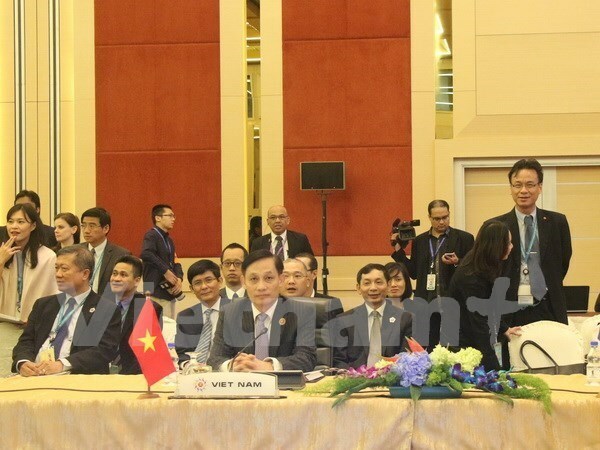 Recent meetings between senior officials of ASEAN and partner countries have reaped good results with discussions focusing on preparations for the upcoming formation of the ASEAN Community, said Deputy Foreign Minister Le Hoai Trung. The Deputy FM highlighted the results reached during the ASEAN Senior Officials Meeting (ASEAN SOM), the ASEAN+3 Officials Meeting (SOM ASEAN+3) and the East Asia Summit Senior Officials Meeting (SOM EAS) in Kuala Lumpur on August 2-3 while granting an interview to Malaysia-based Vietnam News Agency correspondents on August 3. He said ASEAN senior officials joined meetings within the bloc as well as with three partners – China, the Republic of Korea (RoK) and Japan – at the SOM ASEAN+3 and with China, the RoK, Japan, Australia, India, New Zealand, Russia and the US at the SOM EAS. At the meetings, ASEAN leaders and their counterparts reviewed what have been done towards the Community as well as discussed preparations for the ASEAN Summit and the community formation, both scheduled for the end of this year. He also added that a series of important meetings will take place in the coming days, including the 48th ASEAN Foreign Ministers’ Meeting (AMM 48), the 16th ASEAN+3 Foreign Ministers’ Meeting, the ASEAN Post Ministerial Conference Plus One (PMC+1), the 5 th East Asia Summit Foreign Ministers’ Meeting (EAS FMM-5), the 22 nd ASEAN Regional Forum (ARF-22) and other related meetings. They aim to deliberate the building of an ASEAN Community, affirm the central role played by ASEAN in the evolving regional structure and call for support from the group’s partner countries for the ASEAN Community’s establishment. Regarding security, the Deputy FM said countries concurred that peace and security are prerequisite conditions for development and cooperation.